The year’s volume kicks off with a substantial set of articles about requesting (proposed by Kobin Kendrick and Paul Drew, and commented on by John Heritage and Jörg Zinken and Giovanni Rossi) and two excellent pieces on multiactivity: Kristian Mortensen on the interactional business done by cupping your ear, and Søren Beck Nielsen on what doctors do with the props on their desk while dealing with their patients. 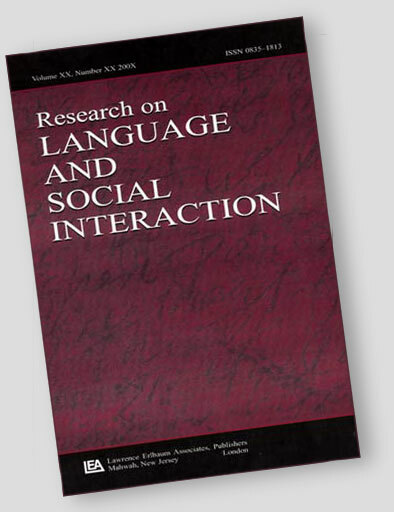 The link to the journal’s website and table of contents for this issue is here. Clicking on the title image in the set below will take you to the on-line paper directly. Readers with University accounts will have direct access if their libraries subscribe. This entry was posted in 2016 Volume 49 Issue 1, Uncategorized on March 3, 2016 by charlesantaki.